To celebrate the release of Suffragette we are publishing two blogs by people who were very special film extras, the first, released as the premier is only hours away, is by June Purvis, Emeritus Professor of Women’s and Gender History at the University of Portsmouth and an historical advisor to the film. Professor Purvis will be known to many as the author of some of the best modern writing on women’s suffrage including Emmeline Pankhurst: a biography published in 2002. 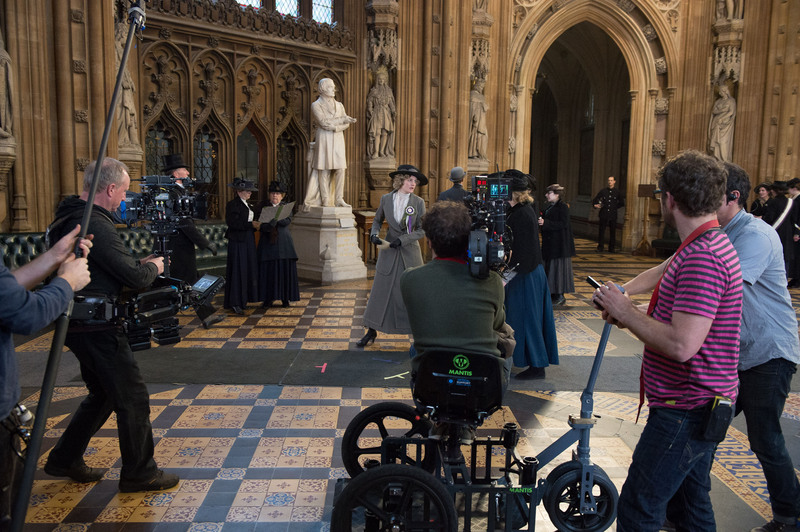 I was thrilled to be asked to be an ‘extra’ in the film Suffragette, directed by Sarah Gavron with script by Abi Morgan. Although I was one of the historical advisers to the director, a task I greatly enjoyed, I never expected to be an ‘extra’ and had no idea what was involved. The focus of the film was to be on the years 1912-3 when, after years of mainly civil disobedience, the suffragettes turned to more militant tactics, such as mass window smashing of shops in London’s West End, vandalising pillar boxes, and setting fire to empty buildings. Would I, as an extra, be expected to join in a procession of women protesting outside the House of Commons, demanding the right to the parliamentary vote? Break a window? Set fire to a pillar box? My head buzzed in expectation. Could my daughter Catherine, come too, I asked? The answer was in the affirmative. There was some discussion as to what role I should play – whether I should be in the central office of the Women’s Social and Political Union (WSPU), founded by Emmeline Pankhurst in 1903 to campaign for the parliamentary vote for women, or be a humble WSPU protester. I was finally given my instructions – I was to be an upper middle-class supporter standing, with Catherine, by the edge of a group of suffragettes as they brought a petition to parliament. That way it was assumed I would be free from any rough and tumble, should it happen. On Sunday 6th April 2014, Catherine and I arrived at 6.30 in the morning at the Methodist Central Hall, London, ready to be ‘made over’ for our parts. We were greeted by a young woman who generally looked after us – and advised us first of all to get some breakfast. So we found the breakfast area and tucked into scrambled egg, bacon, toast and a cup of tea. Other ‘extras’ were already in their outfits. Some were reading, others were dozing. Obviously they knew the score better than we did. Soon we were taken to the ‘make up’ section where we were promptly transformed. No make-up was put on our faces – we were told that people look more natural in film without it – but our hair underwent a metamorphosis. My straight shoulder length hair was curled, making it easier to pin up, just like the pictures of Edwardian women’s hairstyles that adorned the wall. Then, to my horror, a hairnet was placed over it! Catherine managed to evade the hairnet indignity, because she was younger. Our next port of call was the wardrobe section where rails of genuine Edwardian clothes were hung, hired from a costume business. What I had forgotten, as various garments were draped on me in regard to what fitted, was just how many layers Edwardian ‘ladies’ women wore – and how heavy the clothes could be. The thick flannel petticoat, then the long dark brown tweed skirt, complemented by a three quarter length dark jacket, fitted relatively well, but before I could be dressed, I had to be squeezed into a waspie! ‘We must get the right shape’, the dresser explained, as the laces on the corset were pulled tight. ‘You need a hat’, she added. A jaunty black hat, with a large feathery bow, was perched on my head. A red fox fur, complete with its head and thin little legs, was draped over my right shoulder. Then a rather battered pair of brown shoes adorned my feet. ‘What do you think?’ the dresser asked. I looked in the mirror. I looked formidable, not a woman to be argued with, ready to confront the Edwardian Liberal Government of the day. Catherine, on the other hand, looked elegant and glamorous in her navy suit, complete with black velvet hat. Soon we were whisked away by taxi to the scene of action, a cobbled pathway, just outside the parliament building but within the fence that divides the seat of democracy from the general public. We were told to stand by a glass porch, and just talk to each other and occasionally, to look at the camera. Carey Mulligan, who in the film plays the central role of Maud Watts, a working-class laundress, walked across the pathway to greet a fellow laundress sporting a black eye, Violet Miller, played by Anne-Marie Duff. Groups of ‘suffragettes’ with banners and placards were present, ready to join in. It was a fine sunny day, no rain, and crowds of curious bystanders were looking on. We shot this scene at least seventeen times, with no words spoken, while distinguished looking ‘MPs’ with silver hair, top hats and coat tails came and went through the glass porch, some looking at us in disdain. We stared proudly back. At lunch we had to put plastic pinafores over our clothes, just in case we dropped any food on them. Talking with some other extras, we soon discovered that some people did this work for a living, at £120 a day. Others fitted it in with their regular job, as did a male clerk who told us that he had been an extra in the BBC soap Eastenders – sitting in a café, drinking a cup of tea. One woman explained how miserably cold she had been in a flimsy dress, when part of an outside crowd scene for the film Les Miserables. After some sitting around and waiting, while other scenes were shot, Catherine and I were ushered into the Lobby of the House of Common. Here we were instructed where to stand and to look as though we were reading a women’s suffrage petition, suddenly thrust into our hands. ‘Look up at the ceiling’, said another voice, informing us that this would have been the first time that women had entered the Lobby – and that we should look amazed, admiring the patterned ceiling. We duly obeyed. When I was invited to a private viewing of the completed film, the Lobby scenes had been cut, but the protest in the courtyard was included, with just a fleeting glance of us both. Such is the precarious life of the extra! Watching the completed film Suffragette, for the first time, was a moving – and stimulating – experience since it tells the story from the woman’s point of view. Bruised and battered after years of peaceful protest in a just cause, betrayed by the false promises of Herbert Asquith, the Liberal Prime Minister, the suffragettes were prepared to go that extra mile. Barred from attending Liberal Party meetings, barred from renting premises to hold their own gatherings, they were forced underground like a guerrilla army. Their bravery, courage and determination to challenge the secondary status of women In Edwardian society is a lesson to us all. Our second Suffragette blog will be published on Monday, 12 October, to coincide with the general release of the film. I saw a movie exactly like this one but dealing with US women’s right to vote. It was called Iron Jawed Angels and starred Hilary Swank. It’ll be interesting to compare the two.